Availability Usually leaves the warehouse in 2-3 business days.Ground shipping guaranteed 3 days or less for contiguous US! 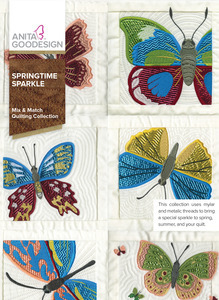 This collection uses mylar and metallic threads to bring a special sparkle to spring, summer, and your quilt. 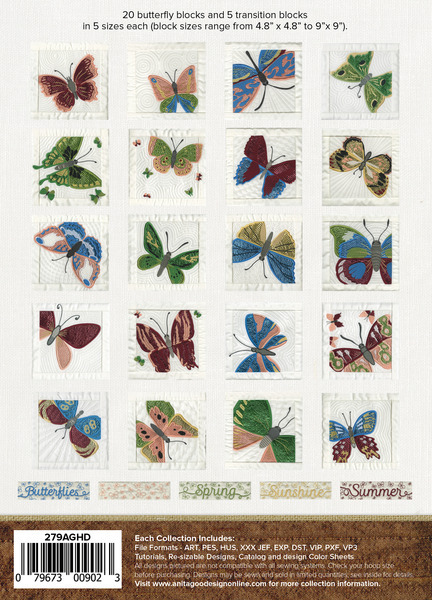 20 butterfly blocks and 5 transition blocks in 5 sizes each. These shiny and sparkly butterflies use Mylar and metallic thread to really show off their shine. Metallic thread, and shiny Mylar can surely bring any quilt to life. The Springtime Sparkle Collection is the perfect way to capture the essence of Spring and Summer. Bring on the warmer weather and longer days! 20 butterfly blocks and 5 transition blocks in 5 sizes each (block sizes range from 4.8” x 4.8” to 9”x 9”).